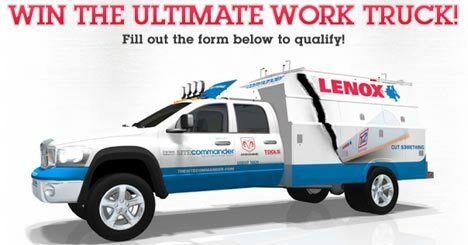 Tools Of The Trade magazine, Lenox Tools, and a number of other sponsors have teamed up to offer the Site Commander Ultimate Work Truck to one lucky winner. The Site Commander is more then just a tool hauling truck; it includes almost everything you would need to be a mobile office, including a total of three computers. My favorite part of the truck is the tricked out on-board Segway X2, and the crazy built in computer work stations. The total prize is valued at over $100,000 because not only are you getting a super cool truck, but it also includes a bunch of extra goodies. “Site Commander” consisting of a 2009 Dodge Ram 5500 HD Chassis Laramie 4X4 Quad Cab® 188.5” WB (MSRP: $56,660, prior to the 2009 Site Commander Tour) (ARV: $56,660), Reading Model UR 132ADWHH Service Body and components (ARV: $28,625), Dell Latitude XFR D630 Laptops (three units) (ARV: $12,555), Mobile office components (ARV: $ 1,975), BedSlide (ARV: $1,300), Weather Guard Ladder Rack and Conduit Carrier (ARV: $1,350), Werner Ladders (ARV: $ 625), Bostitch Air Compressor (ARV: $350), Segway X2 Adventure (ARV: $5,750), Kohler Generator.